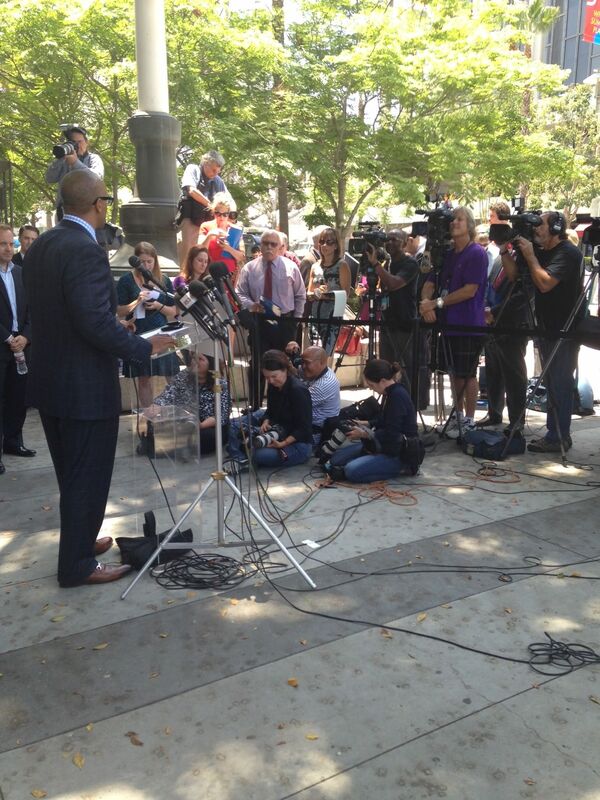 Students’ lawyer, Marcellus McRae, discussing Vergara decision. In a stunning defeat for California’s public school teachers unions, a state superior court today ruled in favor of students challenging teacher protection laws in Vergara v California. It was a total triumph for the nine student plaintiffs, giving them a victory on all counts in an equal protection case aimed at striking down five laws that govern tenure, seniority and dismissal that the students argued kept ineffective teachers in their classrooms. The decision is temporary; final judgement may take as long as 30 days, depending upon any changes or modifications to the ruling. Meanwhile, Judge Treu stayed any changes in the laws, pending appeals. The plaintiffs in the case were nine California school children who claimed that they were deprived of a quality of education by the application of the laws. The state was the chief defendant, joined by its two biggest teacher unions — the California Teachers Association (CTA) and the California Federation of Teachers (CFT). The state and the unions intend to appeal the decision, which requires filing within 60 days of the finalizing of Judge Treu’s decision. Appeals are expected to take months, if not years before the case could reach the California Supreme Court. While Judge Treu’s ruling could spur the legislature to rewrite the laws he struck down before final resolution, the ruling would discourage state lawmakers from minor changes in an effort to satisfy the court’s concerns. The trial became a proxy argument nationally over root cause of poor educational outcomes in highly urbanized settings. Are ineffective teachers partly to blame for low-income students falling behind their more affluent peers, as the plaintiffs argued? Or, as the defendants contended, is student performance less related to teacher effectiveness and more symptomatic of larger societal problems, like unending cycles of poverty and neighborhood violence? The case also became a battle over the power of teacher unions to preserve protections that are not always available to other public employees. The state and the unions argued that the laws help school districts attract and retain teachers while the plaintiffs countered that they keep in place ineffective teachers whose instructional skills deny students the promise of a quality public education. Judge Treu was unambiguous in how he viewed the facts, pointing to unchallenged evidence that thousands of ineffective teachers in California are impacting the quality of education for thousands of students and their lifetime earnings potential as a result. Permanent Employment, commonly known as tenure: He concluded that the state’s two-year requirement to make a decision on tenure is inadequate, finding that “both students and teachers are unfairly, unnecessarily, and for no legally recognizable reason (let alone a compelling one) [are] disadvantaged” by the current law. As a result, he said he finds it unconstitutional under the state’s equal protection clause. Judge Treu also concluded that the laws in questions disproportionately affect low-income and minority students and that a “lack of effective dismissal statutes and LIFO” harm them through the so-called “dance of the lemons,” a tactic often used by districts to send the least effective teachers into classrooms with the high concentrations of vulnerable students.